Café at National Coal Mining Museum for England01924 848806work CafeTake a ‘pit stop’ to refuel at the Museum café with homemade food, hot and cold drinks and tasty snacks. Overlooking the valley to Thornhill and Dewsbury, the Museum café is an excellent place to take time out from discovering all that the Museum has to offer. 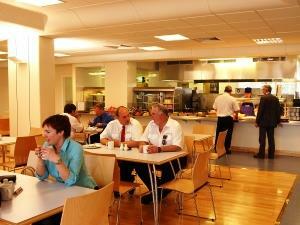 Take a ‘pit stop’ to refuel at the Museum café with homemade food, hot and cold drinks and tasty snacks. Overlooking the valley to Thornhill and Dewsbury, the Museum café is an excellent place to take time out from discovering all that the Museum has to offer. As far as possible the café follows a policy of using regionally produced goods and suppliers or products that have been fairly traded.